Posted by Carolyn Burns Bass in Christian fiction, historical fiction, multi-cultural fiction. MediaMonday for December 3, 2012: Philip Roth Calls it Quits, from New York Times By the Book interview, November 17, 2012. Never underestimate the zest of middle grade readers. The success of such series as Harry Potter, Wimpy Kid, Artemis Fowl, Percy Jackson and the Olympians have kept their publishers in the black and made household names of their authors. This Wednesday in #litchat we’ll discuss the power of middle grade fiction, then on Friday, award-winning author Christina Diaz Gonzalez joins us as guest host to discuss her newest middle grade historical novel, A Thunderous Whisper. 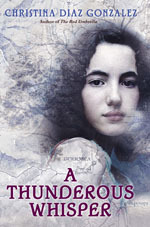 In A Thunderous Whisper, Ani believes she is just an insignificant whisper of a 12-year-old girl in a loud world. This is what her mother tells her anyway. Her father made her feel important, but he’s been off fighting in Spain’s Civil War, and his voice in her head is fading. Then she meets Mathias. His family has just moved to Guernica and he’s as far from a whisper as a 14-year-old boy can be. Ani thinks Mathias is more like lightning. A boy of action. Mathias’s father is part of a spy network and soon Ani finds herself helping him deliver messages to other members of the underground. She’s actually making a difference in the world. And then her world explodes. The sleepy little market town of Guernica is destroyed by Nazi bombers. In one afternoon Ani loses her city, her home, and more. But in helping the other survivors, Ani gains a sense of her own strength. And she and Mathias make plans to fight back in their own unique way. 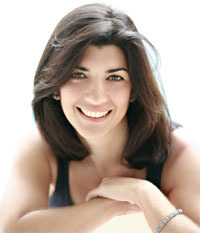 Christina Diaz Gonzalez is the author of the award-winning and best-selling children’s novel, The Red Umbrella. Gonzalez’s debut novel (the story of a 14 year old Cuban girl who is sent to the U.S. in 1961 as part of Operation Pedro Pan) showcases the generosity of the American spirit and highlights the pain of losing one’s homeland. Reviewers from publications such as The Washington Post, Publisher’s Weekly and School Library Journal have praised the book as being exceptional, compelling and inspirational. Follow Christina Diaz Gonzalez on Twitter: @ChristinaDG.